The Dow Jones Industrial Average is one of the oldest stock indexes in the world. It tracks 30 of the largest U.S. stocks traded on the Nasdaq and the New York Stock Exchange, and for this reason is also sometimes known as the US30. These stocks are picked from a variety of sectors, including industrial material, financials, telecommunications, energy, information technology, and health care. Like its rival the S&P 500, the Dow is a representative of the U.S. stock market. It’s often called the ‘blue-chip index’ due to the types of companies it contains. At the time of writing, the Dow has been in an uptrend for more than 9 years. This long-term bull market has been underpinned by the good performance of companies in the Dow, and the stable economic growth of the U.S. So, what are the factors that can affect the Dow? Well, we can’t continue this article without mentioning the important role of the Federal Reserve – the U.S. central bank. It’s responsible for maintaining the balance of the U.S. economy and keeping it growing. Interest rate decisions and announcements from the Federal Reserve, therefore, have a big impact on the Dow’s movement. In addition, the Dow is also affected by U.S. economic data releases as they provide the indication of the current and future state of the U.S. economy. High-impact economic reports such as Employment Change, Consumer Price Index (CPI), Retail Sales, or Non-farm Payrolls can affect traders’ sentiment and make the Dow fluctuate. As mentioned above, U.S. economic data and interest rate decisions from the Federal Reserve can influence the Dow’s performance. Therefore, remember to track them. Use a financial calendar to stay up to date with forthcoming news. Try not to miss any important events, because one second of distraction might cause you to miss a trading opportunity. Stock indices tend to move in one direction because they are based on price moves of the constituent stocks. Therefore, it’s a good idea to track their trends with a long-term moving average. Professional DJIA traders often apply a 200-day simple moving average (SMA 200) to the Dow’s daily chart to measure its trends. When prices are above this line, they look for bullish trading opportunities on shorter-term setups. Conversely, when prices turn below the SMA 200, they prepare for bearish trading setups. Emotions may be good in love but are useless in trading. They negatively influence traders’ rational thinking and reduce their ability in making accurate decisions. Sometimes, the Dow can strongly seesaw and you might react to this by changing your trades. But don’t let its fluctuations affect your long-term strategy. Keep in mind that indices tend to move in one direction, so the major trend should return soon. Also, don’t trade when you are not fully alert or not feeling less than 100% physically or mentally. That’s not beneficial for your finances. You have just discovered some useful tips to trade the Dow. Everything is up to you now. If you’d like to do some trading experiments, open a demo account. Or, if you are confident enough to get instantly into trading for real, go ahead and open a real trading account. One important note: if you just start out, do it small. That will help you gain real experience trading the US30 at a low cost. “One man’s trash is another man’s treasure.” This time-honored quip can no better be applied to any other profession than the venerable American “junkyard.” Here in America, we all grew up within relative proximity to an auto junkyard. The auto parts heaven has always been a great source of certain, simple, or even critical components for any make or model in production. It’s a natural choice to make when money is tight, or even when it is not. It simply makes good sense to visit your local auto graveyard to find that part you need, and most of us have done just that. The quintessential junkyard has indeed evolved. Today, technology and innovation have resulted in the modern parts powerhouses of today. The junk yards in Utah are no exception. Whether it is as simple as a lug nut, or as critical as a transmission, the auto parts yards of today have made it a simple task to find that elusive part, which would otherwise be a large expense. Taking advantage of the junkyard has always proven to be a wise decision, otherwise, they wouldn’t even be around. The value of this classic business model has and will continue to stand the test of time. The history of the junkyard can be traced back to the very early days of the advent of the horseless carriage. One of the more famous instances includes Henry Ford and his exploration of auto graveyards in his day. The observations concluded that some parts survive the life of the car itself and can be reused. The famous “Kingpin” story may be the beginning of the modern junkyard business model. Whatever the case may be, we all enjoy the availability of important car parts at a very affordable price thanks to our local junkyards. These days, the make and model, no matter how exotic and/or rare, can be found in the auto-parts boneyard. The top yards no longer simply let autos sit and deteriorate in a large field. Every auto is thoroughly inspected. Every bolt of value is recovered and provided to the customer. The process has become very efficient, and more of everything for your car is becoming readily available. It’s a win-win scenario for everyone. The used auto parts business model is not just an American phenomenon. It is, of course, worldwide. Millions of cars, trucks and other vehicles such as motorcycles, tractors, heavy equipment and other exotic and rare machines find their way to their ultimate demise, and they leave their precious internal parts to those who need them. It’s the equivalent of an organ donor. Many partnerships have been struck between junkyards and other businesses related to the automotive industry. It’s a natural progression, of course, and such relationships benefit everyone. It is a wonderful thing to see such evolution in business, and the success of such symbiotic pairings is a blessing to all, more often than not. With more and more businesses pairing up and growing the used auto parts industry, more great benefits become available. It sometimes seems that cars are becoming almost disposable. Many people will choose to buy new cars rather than fix what they have. Or, some simply wish to keep getting the new models when there is nothing wrong with the old. There are many instances where perfectly fine cars wind up in the hands of the auto parts dealer. This makes higher quality parts available. Again, another benefit to us all! And now, with the wonderful Internet, finding what we need or want has never been easier. The digital revolution has not left the junkyard behind. Used auto parts businesses have embraced modern technology; naturally and efficiently. When the need arises, and it will, your first and the wisest step is the mighty junkyard. There is no indication that the phrase “Junk Yard” will ever go away. That is another topic altogether. However, when that radio knob pops off for no reason, you now know where to go first. It stands to reason that there is no part you can’t find at your local auto graveyard. It may seem obvious to some, but you and I are but a few amongst billions, and some people may not be aware of the junkyard option. Avail yourself of it. The idea that higher minimum wage helps the working poor is utterly ridiculous. It’s a lie spread by liberal politicians and their supporters so they can take more tax money from individuals. Instead of protecting our life, liberty, and the pursuit of happiness the government actually violates our rights by creating a minimum wage law, which prevents mutually beneficial, voluntary labour contracts between two parties from taking place. It’s absurd that some government official can think they have the right to prevent others from offering their personal services for pay. You have to be an egotistical control freak to believe that you somehow know the magic amount of what a minimum wage should be. You also have to believe that this one arbitrary number can be fairly applied to millions of agreements and transactions between people living in different cities, with different costs of living. That kind of patronizing thinking is pure buffoonery to me. What gives them the right to decide how much my service is worth? Apparently these politicians think it doesn’t matter if the work is shoveling snow, teaching calculus, or giving CPR, because everyone’s time and labour is magically of equal value! But anyone who reads this blog regularly is smart enough to realize this is simply not true in the real world. When I worked at a warehouse earlier this year I was making about $14/hr. My coworkers and I were pleased with our pay. Nobody talked about unionizing because we were all treated fairly. 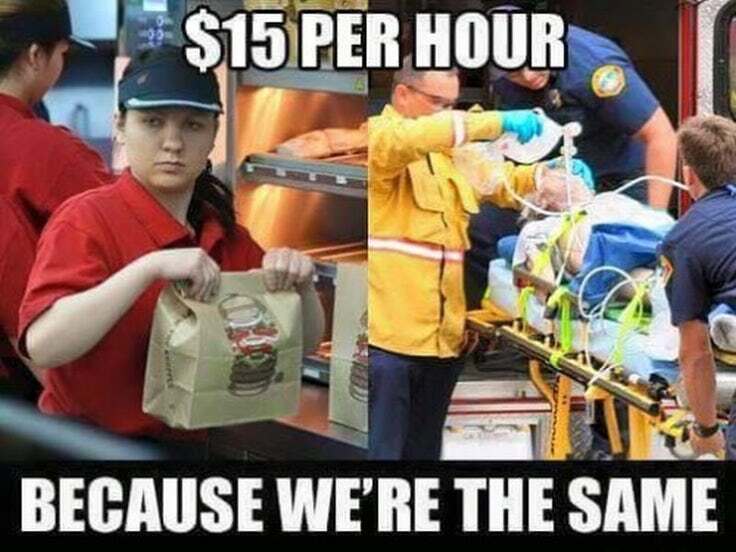 But if minimum wage were to increase then some of us would lose our jobs for sure. Even if we want to come back the law would make it illegal for the company to hire us at $14/hr. It would be very difficult for laid off workers to find a similar job that pays better. Raising the minimum wage displaces workers and increases the incentive to leave the job market altogether to live on social assistance. This is very damaging to the lives of low income workers. There is a myth being spread that governments can somehow mandate employers to pay all their minimum wage workers more money. And therefore, an increase in the minimum wage will benefit those workers. Unfortunately the reality is not that simple. The actual fact is that governments can only give employers the choice of either paying their workers more or employing fewer workers – both scenarios are bad news for low income earners. If the owner employs fewer workers, the least skilled employees are the first to get canned. If workers are paid more, the least productive employees will lose their jobs and be replaced by other people who are more qualified and can provide more value to customers in the marketplace. If an employee only creates $12/hr of value then it wouldn’t be sustainable for a business to pay him $15/hr for his labour. Either that worker’s productivity/ skills/ efficiency have to improve, or he will be laid off. Companies can also invest in new technology to bypass human workers altogether. Furthermore increasing the minimum wage across the board will create inflation and raise the price of goods and services. The people who are most disadvantaged by rising minimum wage are the working poor because their cost of living will increase disproportionately to everyone else. The dollar is devalued and the affordability gap widens between the rich and poor. So if the idea is to help low income workers, then increasing the minimum wage is the antithesis of what we need to be doing. If you are making around minimum wage, then logically speaking you should be the most against raising it because you are most at risk of losing your job.